City in Moravia. Its Jewish congregation was most probably founded by exiles from Iglau shortly after 1426. In the latter city the Jews of Triesch transacted their business during the day, spending the night beyond the city limits, and returning home for the Sabbath. They dealt chiefly in wool, which they sold to the cloth-makers in Iglau. Joseph ben Moses, a disciple of Israel Isserlein of Marburg, mentions in his "Leḳeṭ Yosher" (ed. 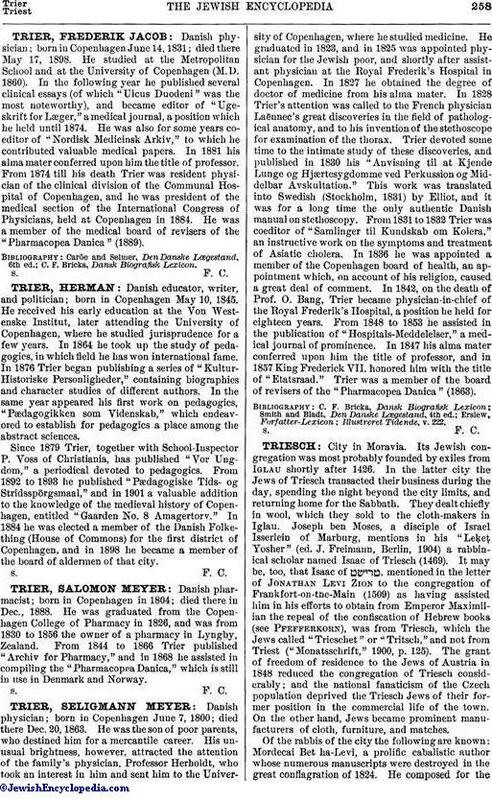 J. Freimann, Berlin, 1904) a rabbinical scholar named Isaac of Triesch (1469). It may be, too, that Isaac of , mentioned in the letter of Jonathan Levi Zion to the congregation of Frankfort-on-the-Main (1509) as having assisted him in his efforts to obtain from Emperor Maximilian the repeal of the confiscation of Hebrew books (see Pfefferkorn), was from Triesch, which the Jews called "Trieschet" or "Tritsch," and not from Triest ("Monatsschrift," 1900, p. 125). The grant of freedom of residence to the Jews of Austria in 1848 reduced the congregation of Triesch considerably; and the national fanaticism of the Czech population deprived the Triesch Jews of their former position in the commercial life of the town. On the other hand, Jews became prominent manufacturers of cloth, furniture, and matches. Of the rabbis of the city the following are known: Mordecai Bet ha-Levi, a prolific cabalistic author whose numerous manuscripts were destroyed in the great conflagration of 1824. He composed for theSeventh of Adar a special service which is still in use. Eleazar Löw, author of "Shemen Roḳeaḥ," was rabbi in Triesch about 1800 to 1810 and, after having officiated meanwhile at Ronsperg, again from 1812 to 1820. He was a prolific author, and took an active part in the controversy on the Hamburg Tempel. Before his second term of office Moses Schreiber urged the candidacy of his own father-in-law, Akiba Eger. Löw was succeeded by Moses Friedenthal, Joseph Frankfurter, B. Friedmann (later in Grätz), and Dr. M. L. Stern, the present (1905) incumbent, who has held office since 1885. Moses Joseph Spiro was a native of Triesch. The congregation of Battelau belongs to the district of Triesch. 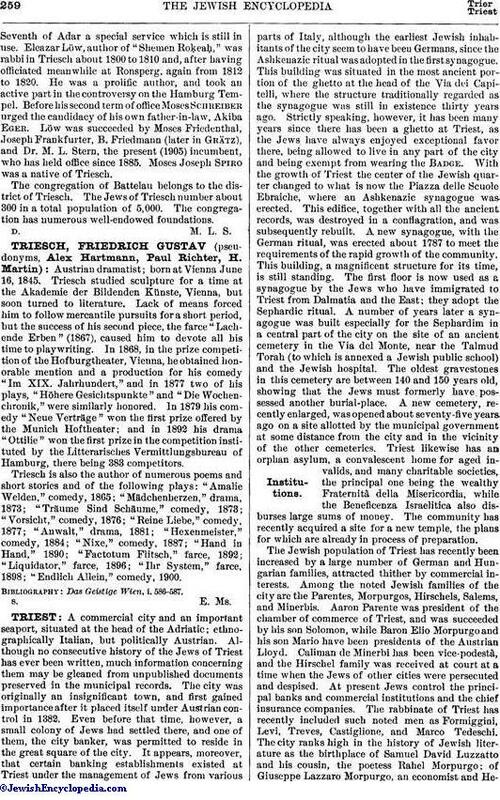 The Jews of Triesch number about 300 in a total population of 5,000. The congregation has numerous well-endowed foundations.